The perfect setting - Olympos 6 has the most stunning, uninterrupted, panoramic sea and island views from the balcony, lounge and shared pool and roof terrace. This lovely, contemporary apartment has a luxurious ambience owing to the white marble floors, beige marble bathroom and cloakroom and sleek white kitchen with eye level cooking facilities and designer fridge/freezer.There are 2 bedrooms; a double bedroom with Juliet balcony and a bedroom which has either a king sized bed or two large single beds. There is a marble tiled bathroom with walk-in, wet room style shower, marble sink and toilet plus an additional cloakroom (also finished in marble with marble sink). 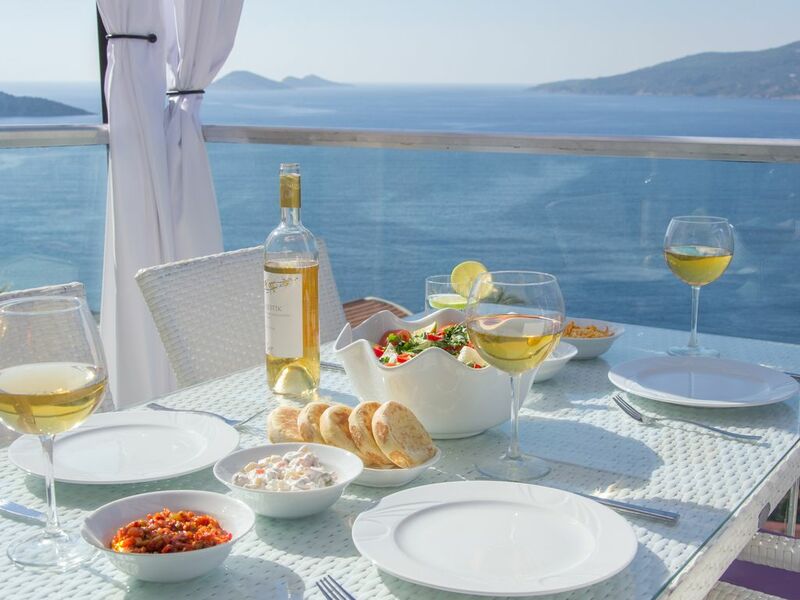 The apartment is situated in the sought after area of Komurluk only a 10 minute walk to picturesque Kalkan with its whitewashed houses festooned with bougainvillea and its many boutiques and famous rooftop restaurants. Its a 10 minute walk down steps to the Palm Beach club with its lovely gardens from where you can take a free water taxi to the harbour or walk 10 mins to Kalkan town beach.The pool is shared between just 12 apartments and has sunbeds, parasols, a shower and a shady arcade. The large balcony has a glass balaustrade to make the most of the fabulous views, a dining table and chairs for 6 and two stylish sun beds. The kitchen area has a designer eye level fridge with freezer below, eye level oven with microwave/combi oven above,dishwasher,washing machine and water dispenser. It is an ideal base for exploring the many attractions of the area such as the beautiful 18km long Patara beach (16km) and Saklikent gorge (30km). Antiquities such as Xanthos (a world heritage site )Letoon and Pinara are within an hours drive. The sunken city of Kekova is accessible by boat from Kas or by road. Retired health care professional from Essex living in Kalkan. Peaceful location yet all the town amenities are accessible on foot. Incomparable views. toilet, Newly added cloakroom with quality fittings and marble sink. New built-in electric oven,microwave and gas hob, fridge/freezer, washing machine, dishwasher, coffee maker, toaster. Access from the road to the apartment is down one flight of steps and access to the apartment is up a further flight of steps - the apartment is therefore not suitable for wheelchair users, those with restricted mobility or families with young children using prams or push chairs. Outside: Shared kidney shaped pool with sunbeds, parasols, a shower and shaded arcade. Access to shared roof terrace. Cleaning / Towels / Linen / Maid service: Towels (including beach towels) and linen are included and are changed weekly.The apartment is cleaned weekly but a mid-stay clean can be provided by arrangement. A "Welcome" pack and transfers can be arranged on request (1.5 hours from Dalaman) Other: Balcony: pergola and curtains, two large rattan sofas and coffee table. Small dining table and 4 chairs. Our second time at the apartment which offers amazing views over Kalkan. The apartment is about a 10 min walk into town where you will find a vast choice of bars and restaurants all offering superb food and drink. We love kalkan. The apartment is well equipped and offers a comfortable stay, the shared pool facility is rarely busy so most days we had it all to ourselves. It was lovely to have you visit our apartment again Tamara - so glad you enjoyed your holiday! We have loved every minute of our holiday in Kalkan. The apartment is fantastic the view from the balcony is definitely the best in Kalkan and every bit as good as it looks in the pictures. The apartment is fantasticly clean and modern with everything you need for a perfect stay. The pool is lovely and never busy, most of the time we had it to ourselves. It is a little walk into town but it’s so easy and cheap to get taxis if you don’t fancy a walk in the heat. A bonus is that palm beach club is a two minute walk below the apartment and has a lovely spot for snorkelling and we always enjoyed the food there. The management and communication with the owners is fantastic they always responded immediately to any requests. They also have fantastic recommendations and Jane who manages the apartment pre-booked for us a private boat trip on the Maya boat which we ended up doing twice it was such a wonderful experience. We also on Jane’s recommendation booked a tour through Yasin at Volume travel to Saklikent Gorge where my boys went rafting and zip lining then on to Patara beach it was another great day. The apartment is really five star and suited us perfectly as a family of four with two boys aged 9 and 11. The apartment also has great air-conditioning essential in the heat and two bathrooms also a massive bonus. Can not fault are stay at all and if we come back to Kalkan which I hope we do we will come back and stay here if we can. Thank you so much for your wonderful review. Jane and I are so glad the whole family enjoyed your stay - there’s plenty more to explore and experience should you wish to return! Beautiful views of the bay from balcony. Fantastic apartment ideally located just outside of town, this was the perfect base to enjoy 10 days in the Kalkan sun. The apartment itself was clean, spacious (enough for two or more) and comfortable with beautiful views of the bay. It was well stocked with everything you might need to cook your own meals if you didn't fancy heading into town and the welcome pack was certainly very welcome after travelling in from Dalaman. The shared pool area was very nice and again clean, although can get very hot at peak times of the day. Thank you Keith for your great review which I have also forwarded to Jane at Lale Homes. It will be a pleasure to welcome you back to Kalkan - 5* guests! We have visited Kalkan for 6 years and still find it charming with a relaxing vibe (people are amazing) The apartment has the most amazing views, is fully equipped and very comfortable to stay in. It is positioned a short walk from the town which helps you build an appetite for your evening meal and then ensures you walk it off on the return. The town has many fantastic restaurants to suit everyone's budget most of the time it's fantastic value! The whole experience of booking this apartment was smooth and efficient from start to finish.Thank you Sarah for allowing us to stay in you beautiful apartment. This apartment was perfect. Home from home with it's spacious rooms, lovely walk in shower and the highlight for us the balcony with the lovely rattan furniture and a unforgettable view. The kitchen was equipped to a very high standard and the bonus of a washing machine and dish washer was appreciated. The apartment and the block were very clean and the caretaker was always around cleaning the pool area watering the beautiful plants. Kalkan is magical with it's roof top restaurants and cobbled streets. There are any amount of places to eat and we have never had a bad meal. All in all this apartment made our holiday superb and hope to return. Many thanks for your lovely feedback. We look forward to welcoming you to our apartment in Kalkan again. Palm Beach Club: 5 minutes walk down steps. Swimming from platforms. Kalkan town beach: 8 minutes walk along coast path (one steep section) or 12 minutes walk by road. Several other beach clubs around bay accessible by free water taxis from harbour. Kalkan town 10 minutes flat walk, 3 minutes drive. Kas is 25 minutes drive along a coastal road offering spectacular views. There is a regular Dolmus service. Antiquities such as Xanthos, Letoon and pinara are within an hours drive. Patara beach is 16km away and accessible by Dolmus or taxi. Kaputas beach at the end of a gorge is 15 minutes drive on the road to Kas. Kalkan has several supermarkets, banks and many shops (green grocers and butchers) selling fresh produce There are innumerable restaurants around the harbour and on rooftops in the old town and a wide choice of boutiques. Turkish Gulets offer several choices of day trip destinations from Kalkan harbour and there are several water sports activities available from the many beach clubs. Walking opportunities are afforded by Kalkans situation on the Lycian Way. The security deposit is payable with the balance payment of 75%.It will be refunded (subject to no damage) within 7 days after completion of the holiday. .